rulers, deities, warriors, martyrs and lovers. From fierce Amazons to the heroic Queen Esther, from a Mesopotamian goddess to celestial Buddhist maidens, the ensemble presents an enchanted evening of mystical adventure. 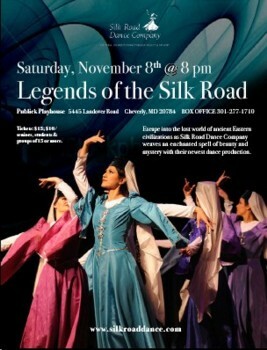 Highlighted by breathtaking costumes and compelling music, the Legends program at the Publick Playhouse on November 8, included rare dances of Iran, Uzbekistan, Tajikistan, and the Caucasus Mountains. Under the artistic direction of award-winning choreographer and costume designer Laurel Victoria Gray, Legends of the Silk Road draws inspiration from the feminine power and beauty of women's dance of Silk Road cultures.The first half of the program evoked long lost civilizations and pre-Islamic traditions -- paganism, Zoroastrianism, Judaism, and Buddhism -- while the second portion presented Turkic and Persianate dance traditions of Muslim cultures.